I suppose it goes back to my schooldays. I always liked writing stories, and English was one of my favourite subjects. When a short story competition cropped up in 2007, I decided to give it a shot and one of my submissions ended up in the top ten. It didn’t win – that would have been expecting too much – but it gave me the confidence to push on, and I found a couple of writing sites. It just seemed to go from there. I’m 60 this year, have been married for 36 years and have two grown up children. I’ve lived in Derbyshire all of my life, and try to write as much of the locality as I can into my work. I’m the son of a collier who came through the state education system, became an accountant and this profession has given me the freedom to write whilst bringing in an income. Do you write full time? How much of your life is set aside for writing? No – I wouldn’t be able to bring in enough income, and do not have an agent to push my work. The writing, at the moment, is strictly part-time, and for the sheer enjoyment of seeing my books in a library or book store. Timing is tricky, as there’s no set day or time for writing. I just do it when the story tells me that there’s another chapter to write. Weekends, lunchtimes and evenings are best, but I never try to force myself to write – that’s the way that errors creep in. The last one, released in 2011, was ‘Threads of Deceit’. It’s a crime novel, set in the textile industry, and tells the tale of a young man’s ambitions derailed by something which he sees. There’s murder, fraud, embezzlement, drug trafficking, deception and betrayal weaving in and out of multiple plot lines, and the whole book is written around a single, five-minute event which occurred in a northern pub over twenty years ago. 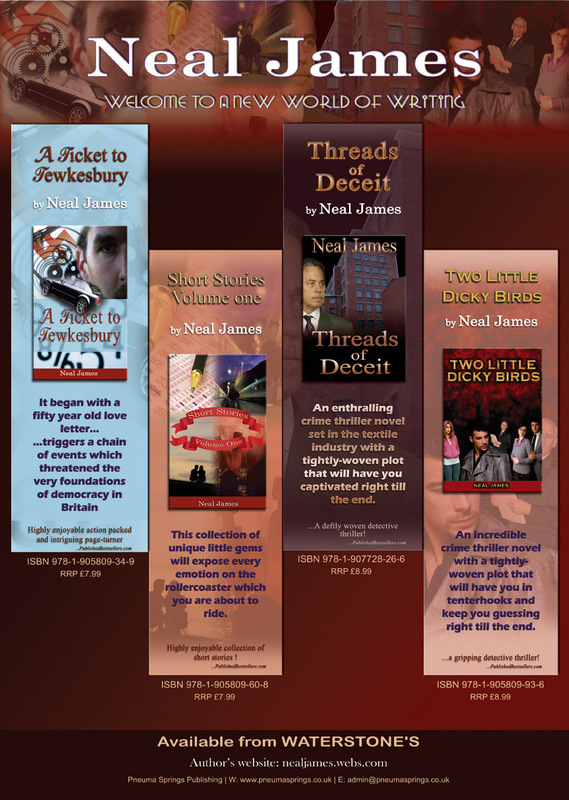 ‘Threads’ is set in the West Country, in and around the town of Taunton, although the storyline comes from my home town of Derby, and the events in the plot reflect the eighteen years I spent in the textile industry. There are no direct links to actual characters from the time of the book, but if you know your way around the city certain locations become apparent.